Is It Good? Young Avengers #15 Review – AiPT! Those immortal words often ring true today as much as they did in Shakespearean times, and when it comes to comic books like Young Avengers, it’s even more applicable. Young Avengers #15 is the final issue of the second volume of this series from Kieron Gillen and Jaime McKelvie, a journey through the lives of a group of superhero teenagers. Is it Good? The short answer is yes, this comic book is very, very good. I point out that this is the end of the second volume of the series because that actually carries a lot of weight. The original series only lasted 13 issues (if you count the Young Avengers Special #1), and those characters only appeared in mini-series and one-shots thereafter. Gillen and McKelvie’s Marvel NOW! 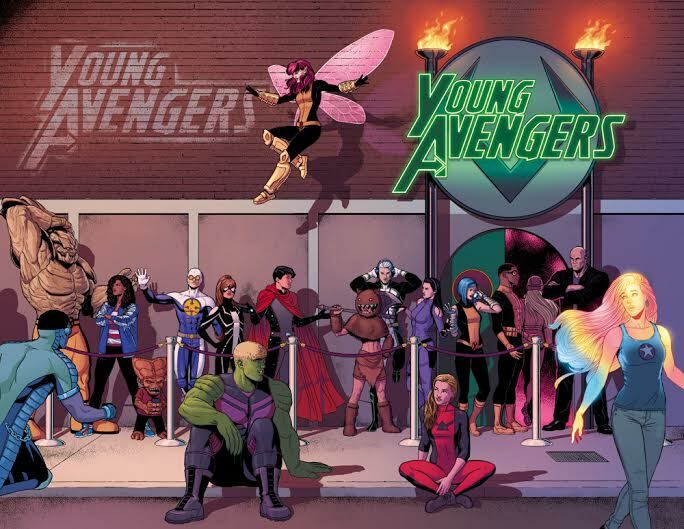 Young Avengers is the spiritual “Season Two” of the franchise. Much like how the second season of NBC’s Community made me love the show even more than I possibly could have guessed after a phenomenal first, Young Avengers, Vol. 2 included a lot from Alan Heinberg and Jim Cheung’s run, but also went in it’s own, unique direction that let it stand on it’s own merits and, in many ways, improved upon the original. Young Avengers #15 is not only the end of the series, but also the conclusion to “Resolution”, the ‘season finale’ that sees nearly every teenaged superhero in the Marvel universe blowing off some steam after defeating Mother, the interdimensional parasite that was undetectable by adults. Though McKelvie was the regular artist for the series, a few more artists jump in to lend a hand with the different vignettes Gillen writes to wrap up the saga of the Young Avengers in 2013. Becky Cloonan handles Marvel Boy. So often, teenagers see the end of a relationship as the end of the world. Noh-Varr actually faced the end of the world with the rest of the teenagers and won, but it’s only now—while he DJ’s the party and has to decide whether to play one of his favorite tracks by the Ronettes or Daft Punk’s 2013 mega-hit “Get Lucky”—that he recognizes that nothing lasts forever, and that he has to let Kate Bishop go. It’s an emotional revelation for Marvel Boy that’s hastily undercut by Broo’s noninterest and over-interest in his new DJ algorithm software. Ming Doyle illustrates the conversation between Loki and Prodigy wherein Loki comes to the conclusion that his time with the Young Avengers is over. In a way, he always knew it couldn’t last, but as the Norse god of mischief turns the page in “an old story who happens to be me”, he finds solace in the fact that, in his own twisted way, he made an impact on these kids. He may have been the one who brought them together in the first place to fix a situation he had created, but he ended up growing fond of his friends and they of him. Loki is a paradoxical character because he’s the bad guy, but you still find yourself rooting for him. I suppose all the Loki fanboys and girls out there understand after 2012’s The Avengers, but it becomes all the more apt in this situation. Joe Quinones takes Prodigy, a young man who still hasn’t quite figured out who he is. He’s accepted his sexual identity, but (obviously) that’s not all there is to him. David is a genius, but he still can’t figure out who Patri-Not is, a puzzle that the rest of the team kind of forgot about after defeating Mother, but one David simply can’t let be. His theory comes down to Patri-Not being a sort of guardian angel that led the Young Avengers on their path to defeat Mother, a extradimensional being that somehow understood that these kids needed a concrete reason to keep up the fight, and the image of their old teammate seemed to do the trick. It turns out that Tommy (a.k.a. Speed) was the physical vessel for the entity, but David finally comes to terms with the fact that he can’t figure everything out all the time. The final pages of Young Avengers #15 are some of the best. The core team makes their way out of the party and a casual conversation quickly shows that Kate Bishop may be the only straight one in the group. Normally, I’d not find such blatant discussion of sexuality all that important in a comic book, but Gillen’s masterfully subtle approach is just the way to do it. Headlines were made over the past few years about small bits of homosexuality leaking into comic books (see Astonishing X-Men #51 and Earth 2’s Alan Scott), but Gillen’s take is that sexual identity doesn’t define a person, and it’s not as big of a deal as DC and Marvel would like to make it’s readers believe. That may sound callous, but were there major news outlets reporting on the fact that six of the seven Young Avengers are gay or have at least experimented? No, because there didn’t need to be. Young Avengers #15 is a highlight for the series. Kieron Gillen and Jaime McKelvie created something special with this run, and these last two issues truly showed that it was a once in a lifetime event. There may be other volumes of Young Avengers in the future, but they’ll obviously be different, and they won’t have the same panache this creative team brought to the table.